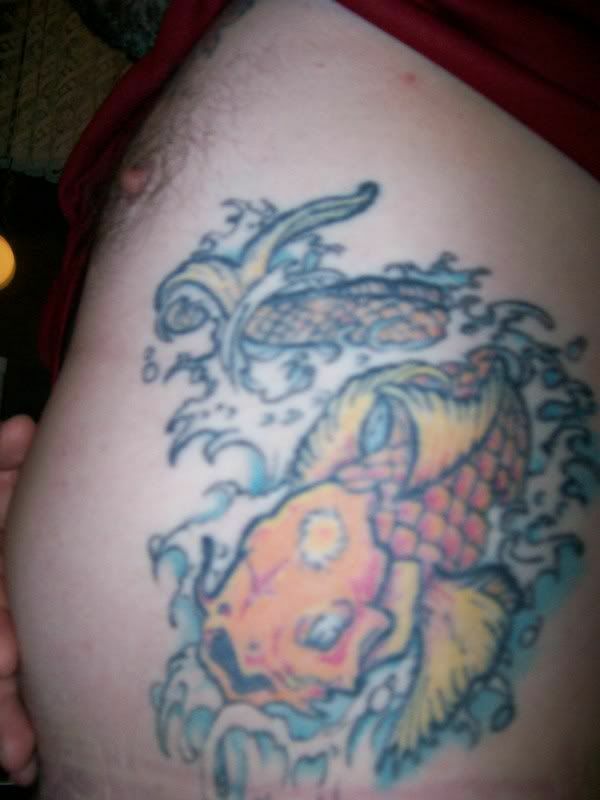 Here is my favorite a coy fish I got about 6 yrs ago in Toledo, from a friend from Kansas who has been a Tattoo Artist for 40 yrs. It took 5 and a half hours then the next day I rode the motorcycle home through two tornadoes that hit Guelph, and driving rain for about 6 hours. Destiny, Strength, Bone, Power, Pain, Love. Sadly I am... that was before I got my first kilt. 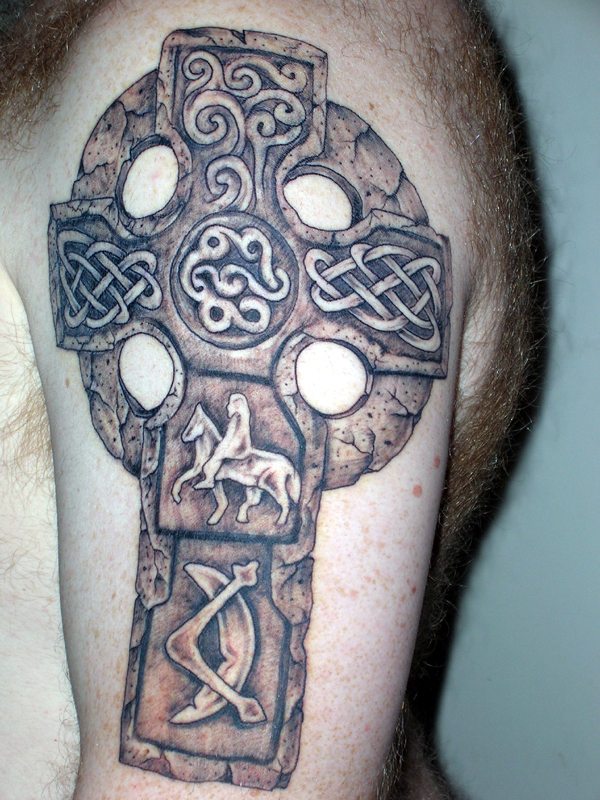 Once I get some more of the work I want done on my back I'll add a new picture, with a kilt on. Or I'll have someone retake this type of shot in one. I only have the one. which I got after my son passed away. I have a couple more that I want to get done but I usually get told " what will it be a kilt or a tattoo?" those are amazing! your wife is very talented!! Nice work. Between the handy work your wife did, and the tattoo work she's done on you, I'd say you're definitely a lucky guy. Any shots of the Pictish work that you have on your face? below is my only (and by default my favorite) tattoo... like kilts, i can't have just one, and like kilts, they are not cheap. i got this one less than a year ago. i got it done here: Warlock's in Raleigh NC by Ernie. it took a little over 3 hours. everyone in the shop was surprised that my first tattoo was so large, they also were surprised that i never asked for a break. i guess people react/perceive pain differently. i didn't think it was that big a deal. i'm not trying to brag, for contrast, put me in the dentist's chair and i become a whining little pansy. i already know what i want next, and my wife is completely against it cause it will be too big... what i am after is something along these lines: click here, and here, and here. basically i want a norse style dragon that snakes its way from my shoulder to ankle wrapping and winding its way down. I'll post pics of mine tomorrow, after I get it. 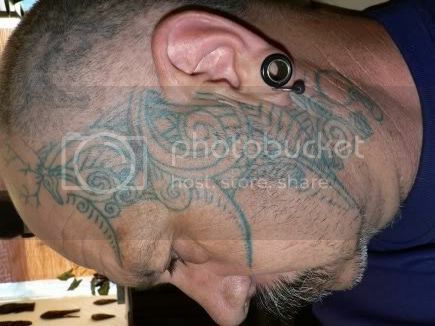 wages, that is a great tat! Wages hasn't posted in this thread. 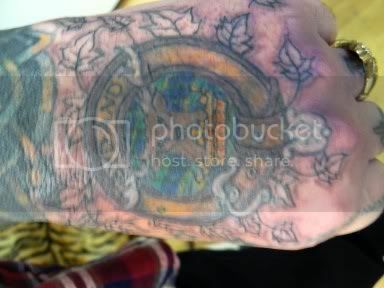 woops...Furrycelt...that is a great tat!! Sorry..you can't see my tattoo, this is after all, a "Family" forum..besides, I'd be moon'n y'all and we don't want that do we? I like that cross. THAT looks like something I WOULD get. "red wookie"... LOL... i love it... i'll have to tell my friends that one. Any shots of the Pictish work that you have on your face? This shot is before it was finished. That big gap on the cheek is now filled with a torc, which symbolises my place as head of our family now that my mother has passed (it also works well on a clan basis if combined with the stag on my temple). 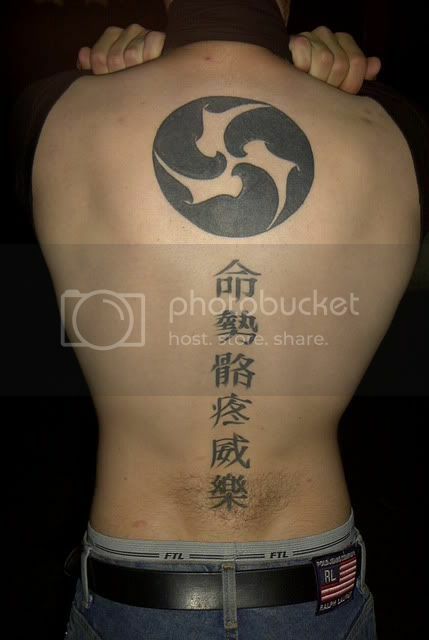 There are also two more horizontal slashes, the four of which symbolise parental deaths. The mirror & comb on my neck is a memorial to a female who has passed, in this case my youngest daughter Lauren. I also have the three warrior marks from my lower lip to my chin. My face is finished now, but I plan to extend my neck right down to my collarbone. I need to add the "z-rod" in there somewhere. Here's a pic of my favourite little Celt at work. That's a mirror & comb, on top of the "V-rod" on her forehead. Very nice work there, your wife did a great job. That's something I don't think I could do myself, but still awesome. I got my first one tonight...or rather last night... the burning is keeping me up late =) It's my favorite... It's a Haida Spirit Eagle and in the center I added a Japanese Mon of a Kikyo -Bellflower. =) No one told me i'd want to hurl like when you get a bad sunburn. No pain no gain! that is an incredible tattoo!! That's a very nice looking tattoo! 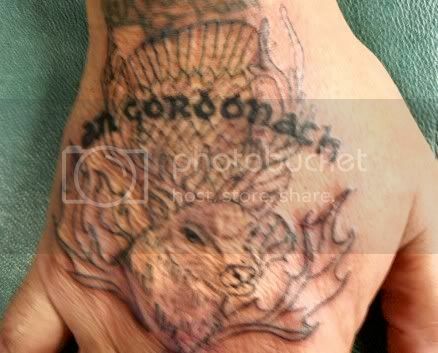 Excellent work Megs, thats a big piece for your first one, congrats on the new tattoo.